Hi friends! I hope you’ve all been having a fantastic long weekend. I’m visiting friends of mine up in northern Alberta, so today’s post is just going to be a a quick and dirty outline of why I recommend that all my clients avoid wheat and other gluten-containing grains for at least 4 weeks upon coming to see me. There are very few compelling arguments (really none that I’ve ever seen) for eating wheat, but in my experience personally and professionally, I’ve found that a large amount of niggling little health issues can easily be managed by making simple dietary switches, such as removing gluten and all products containing it, from the diet. 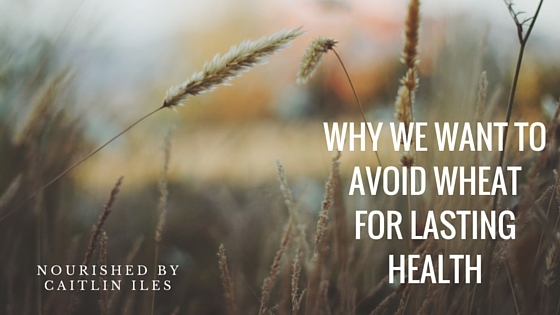 Little things such as joint aches and pains, eczema, acne, water retention, and the dreaded spare tire around the midsection can all be associated with a wheat allergy or intolerance. Wheat and other refined carbs cause cyclic blood sugar highs and lows, which lead to weight gain, energy crashes, and a constantly insatiable appetite. Insatiable cravings, nausea, nervousness, anxiety, headaches, and/or paranoia if you go longer than about 8 hours without it. Wheat provokes the formation of small LDL (cholesterol) particles, which are strongly associated with an increased risk of heart disease. It can contribute to chronic inflammation and autoimmune diseases by increasing intestinal permeability and initiating a pro-inflammatory immune response. See this study for more information. Intestinal permeability is associated with inflammatory conditions throughout the body such as acne, arthritis, and psychological imbalances to name but a few. Grains also contain phytates, which disturb digestion and block iron and zinc absorption, and lectins, which are indigestible (wheat germ agglutinin) and can damage the digestive tract causing inflammation. Watch for wheat and other grains in processed foods. In Canada most products containing gluten must clearly specify so on the label, but if you’re especially sensitive watch for cross contamination and cross reactivity. Cross reactivity happens when certain foods contain protein sequences that are similar to those found in other foods to which your immune system is primed to respond to. So in the case of someone with celiac disease, whose immune system has created antibodies that react to a specific protein sequence in gluten, they may also react to corn, sesame, instant coffee, dairy proteins, brewer’s/baker’s yeast, oats, sorghum, millet, rice, and potato. Cross-reactivity is similar to molecular mimicry, except that instead of attacking other food proteins, your immune system begins to attack your own tissues. When your immune system is primed to attack a specific protein sequence in a food it can sometimes see a similar protein sequence in bodily tissues, which causes it to launch an attack. This response is how autoimmune conditions are thought to be created. Check out these articles by Mark Hyman, MD and William Davis, MD (and this one by Dr. Davis) for more information on some of the effects of gluten consumption on the body. Basically, I recommend strictly eliminating it from the diet for at least 4 weeks, then reintroducing it and seeing how you feel. You never know what benefits you might gain from this little experiment and in the grand scheme of things, 4 weeks is nothing. Digestive Wellness: Strengthen the Immune System and Prevent Disease Through Healthy Digestion—Elizabeth Lipski, PhD. These books can be found at my affiliate Amazon Store by clicking here.